I am surprised to say that Emma is my favorite Jane Austen novel. I have read all of Austen's novels two or three times, and Emma has held her place as first in my affections. She might not be surprised about that. Emma often gets a bad rap as petty, selfish, and spoiled. She certainly has her flaws. But I was prepared for that when I read that she had grown up "with very little to distress or vex her." At the start of the novel, Emma has not yet been challenged to grow in virtue by facing hardship. 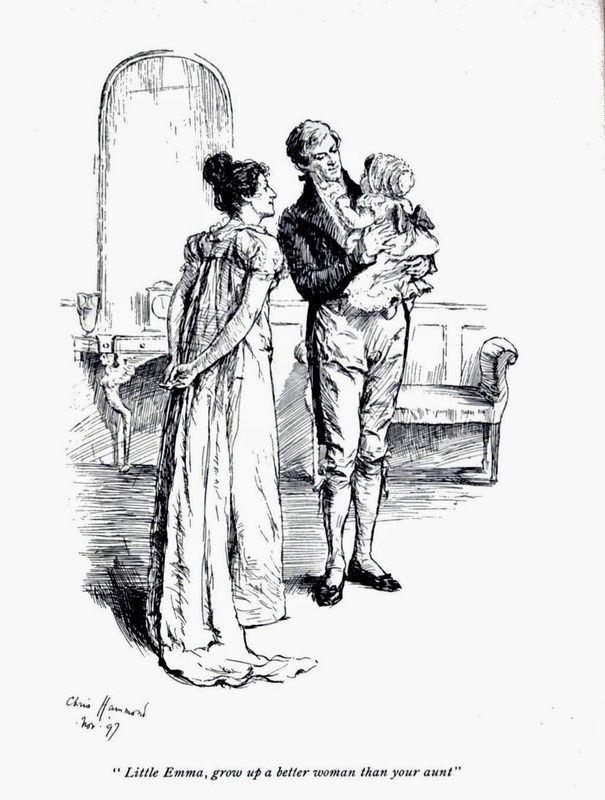 Mr. Knightley talks about Emma's resolutions for self-improvement that never come to pass, how she gets what she wants because she is clever, and warns that she is not doing her friend, Harriet, any favors by meddling in Harriet's romantic affairs. Annoying as Emma can be, there is a lot of good underneath her flaws. Re-reading the novel and reflecting on her has made me realize that there are many reasons to love Emma, as a character and as a novel. I really admire how spirited and upbeat Emma is. Being quite meloncholic myself, I often forget how much being cheerful helps others be more joyful. Emma wants to see people happy, or at least smiling. She brings a lot to the table simply by being positive. Yes, Emma is wrong to meddle with matchmaking as she does with Harriet, but that does not mean that her friendship with Harriet was devoid of good intentions. It's easy to forget that, in British society at that time, it truly was advantageous for Harriet that Emma befriended her. And as for the meddling, I think that Emma sincerely does not belive that any ill could come of it--her view of life is too rosy for that. She simply wants Harriet to be happy and secure. Emma thinks so well of Harriet that she is confident that Harriet will make any potential suitor happy. Austen herself says that Emma has "a disposition to think a little too well of herself." But keeping in mind Emma's position as a daughter in the highest family in Highbury society, I think she is less conceited than modern people typically find her. It is true that she thinks of herself more highly than she ought, but in the heirarchical society of Georgian England, her accomplishments and her rank make her a socially important figure. 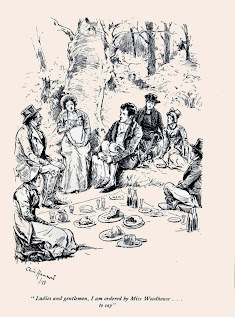 In spite of a somewhat exaggerated view of herself, Emma does have some humility, and it grows as the novel progresses. For a start, she is always convinced that people are in love with Harriet and not with her. She is shocked to find that Mr. Elton prefers her over Harriet because the thought apparently had never occurred to her. Yes, that's a bit naive, but the naivety is mixed with humility. While others look down on Harriet for her simplicity and obscure origins, Emma focuses on her friend's good qualities. She doesn't even think Harriet is too good for Frank Churchill, a man that Emma thought was perfectly suited for herself. Emma is also humble with regard to her father. I know that I would not be as patient as she is; she is unwavering in her cheerfulness and sweetness towards him. She does not pout and complain because he restricts her. She does not treat any of his wishes as unimportant or silly. Emma respects her father and makes him feel loved and important. That takes great humility when dealing with a high maintenance hypochondriac! Though Emma may argue with Mr. Knightley, she shows humility by her deference to his superior judgement. At first, it is slow and interior. Yet as the novel goes on, it gradually comes to the surface. Emma admits to Mr. Knightley that she was wrong about Mr. Elton. She also admits to him that she succumbed to vanity in admitting Frank Churchill's gallantry on Box Hill. Emma's bravery in acknowledging her flaws willingly and simply, laying the chief blame for them on herself, is admirable. Back to Harriet. When Emma finds out that Harriet has affection for Mr. Knightley, and that Harriet thinks that Mr. Knightley returns this affection, Emma takes it seriously. She doesn't assume that he could never want Harriet over her. She also doesn't put herself forward and try to "steal" Mr. Knightley away. Emma tries to submit to the consequences of her folly, blaming no one but herself for the potential loss of the man she really loves. What about the people that Emma doesn't like: Miss Bates and Jane Fairfax? it is true that Emma is unrelentingly negative about these ladies for most of the novel--and behind their backs, too! But her negativity does not last forever. Mr. Knightley gives her a wakeup call after the Box Hill outing. When he chastises her for her treatment of Miss Bates, Emma does not write him off; she reflects soberly and she changes quickly. Henceforth, she persistently tries to act as she should have been acting toward Miss Bates and Jane Fairfax all along. She doesn't do this because she wants Mr. Knightley to like her. If it were only that, her efforts would have flagged after he forgave her. But they do not. She does it simply because she realizes that she was wrong, and because she wants to do right. This change in Emma shows real growth in Charity. She learns to love those whom she does not like, and to see value in them that she could not see before. For this reason, Emma now endeavors to use her position in society to benefit the people that she previously wrote off as "rediculous," not just pretty and plesant girls like Harriet Smith. But her actions are not condescending. She seeks friendship with Miss. Bates not so as to look down on her from a position of superiority, but rather because she is starting to value Miss Bates as a person. Emma grows in this novel. She doesn't do everything perfectly, she stumbles along like the rest of us, yet by the end of the novel she has made real progress in humility and charity. She admits when she is wrong, she changes, and she grows in virtue. Emma is good-hearted, and I find it impossible not to love her for it! I like Emma to, I think she is a sweet girl. Yes, a bit spoilt but not at all unwilling to change and grow. Her change towards Miss Bates is lovely. Yes, whenever I read an Austen novel, I love the heroine that I am reading. But I always come back to Emma as my favorite :-). I pinned this. :) Great thoughts here, Heather, and some that I've never heard before---Emma's humility about men being attracted to her, to name one. It goes along with Mr. Knightley's observation to Mrs. Weston toward the beginning of the novel, that she's not vain of her "person." Thank you, Rhonda, your compliments mean the world to me :)!